Bollywood actress Sonali Bendre has been in the US since July, undergoing treatment for cancer. She announced her illness in an Instagram post and ever since, she has kept her fans and well-wishers apprised about her condition. Her positivity in the face of adversity is commendable. 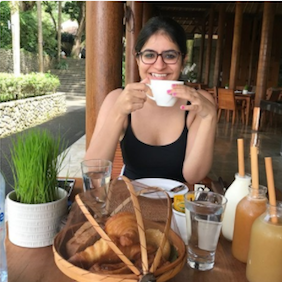 She’s taking one day at a time and turning on the sunshine, she writes on her Instagram. She’s away from home this Ganesh Chaturthi while her family brings home a Ganpati. 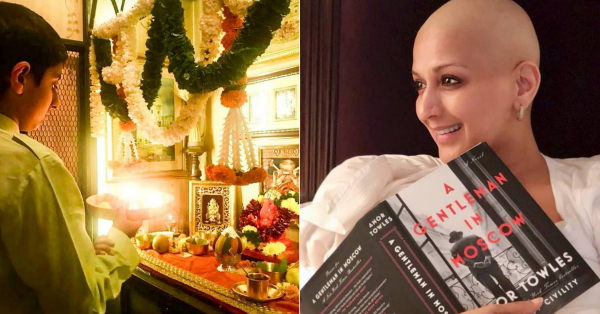 Sonali still feels blessed as she shares pictures of her son Ranveer and husband Goldie Behl worshipping the deity. #GaneshChaturthi has always been very very close to my heart. Missing the celebrations back home, but still feeling blessed. Have a happy one, filled with blessings, love and joy! The festival has always been closer to her heart. Even last year, the actress wished her fans on her Instagram account and posted a picture of herself in a beautiful traditional outfit. Sonali, who has been greatly admired in movies as Hum Saath Saath Hain and Major Saab, has talked about sharing the news of her illness with her son. The 13-year-old has become a source of strength and positivity in her life and he has handled the situation maturely. She is proud of her ‘not so little one’ and misses him terribly. Even Sonali’s friends have rallied together to give her support. Her friends, Sussanne Khan, Gayatri Oberoi and Dia Mirza, have been rearranging their schedules to visit her in New York and call and message her so she never feels she’s alone. The courageous actress has shared many photos and talked about her journey: getting treatment, chopping off her hair and finding a positive side to life.